A diagram is commonly defined as “a simplified drawing showing the appearance, structure, or workings of something” (OED). Moreover, diagrams have been argued to be “media that provide a point of linkage between thinking and intuiting, between the ‘noetic’ and the ‘aesthetic’” (Krämer, 2010) for their being ‘in-between’ image and text, saying and showing. This capacity to act as mediators renders diagrams particularly apt to be discussed in the context of research methodologies for the Humanities and Social Sciences. Arguably, in fact, there is a need for methodologies capable of attending to the social and cultural world as mobile and open-ended, tactile and affective, and that account for performativity within the method. In addressing these aspects of methodological research, this series aims to propose diagramming as a visual, haptic and kinaesthetic methodology. The first masterclass will be lead by Prof Sybille Krämer (Freie Universität Berlin) on Wednesday 16 May at 6pm at Goldsmiths (Room 302, Professor Stuart Hall Building). Places are limited, registration is free, but essential. Please contact: p.crespi@gold.ac.uk. We live in a three-dimensional world, but we are surrounded by surfaces that are covered with images and writing. From cave paintings to skin tattoos to graffiti, from painted pictures to written notations, from diagrams, technical drawings, and maps to film, television, computer screens, tablets, and smart phones, our everyday practices are permeated with surfaces that represent something. What does it mean for our thought and cognition that nearly everything related to the acquisition, justification, and representation of knowledge is organized in the medium of pictorial and written surfaces? Just as the invention of the wheel facilitated mobility and creativity in the world of the body, the invention of artificial flatness facilitated mobility and creativity in the world of the mind. 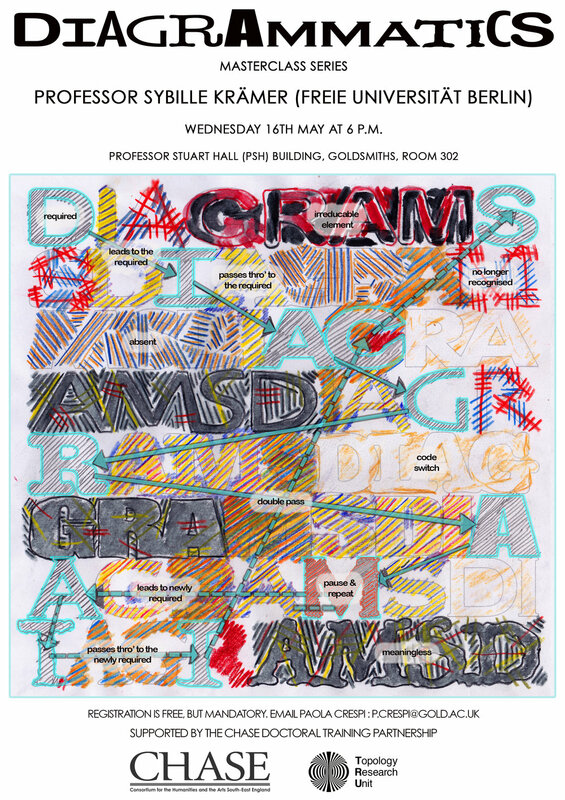 The talk reflects on ‘flattening as a cultural technique’ and develops a ‘grammatics of diagrammatics’. Professor Sybille Krämer is Professor of Philosophy, Freie Universität Berlin; 2000-2006 Member of the ‘Wissenschaftsrat‘ (German Scientific Council); 2005-2008 permanent fellow Wissenschaftskolleg zu Berlin; 2007-2014 Member of the Panel of the European Research Council, Brüssel; 2008-2013 Chair oft the ‚Doctoral School‘: Notational Iconicity‘; 2008 – 2012 Member of the Cluster of Excellence ‘TOPOI. Space and Knoledge in Antiquity; since 2009 – 2016 Member of the Senat of the DFG. Visiting professor: Technical University Vienna, Austria; Max Reinhard Seminar Vienna Austria; University of Graz, Austria; Luzern University, Swiss, Zürich University Swiss; Tokyo University, Japan. Doctor honoris causa by Linköping University/Sweden. Research fields: Philosophy of language, images and writing; Mediaphilosophy; Diagrammatology; Epistemology and Theory of Mind; Philosophy of Culture; Ethics and Episteme of Testimony. Places are limited, registration is free, but essential. Please contact: p.crespi@gold.ac.uk.